This pup lights up when Last Hope volunteers give him attention. 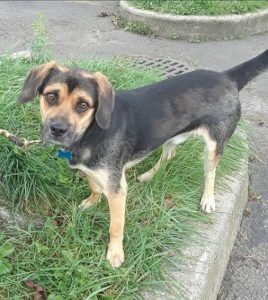 LOGAN is an 11 month old Beagle/Puggle from a Kentucky shelter. Beagle/Puggle really means he is mostly Beagle with a little bit of Pug heritage. He was afraid to leave his crate when he arrived on Saturday. Didn’t take long for LOGAN to realize Last Hope was a happy place to be, and our volunteers were his new best friends while he waited for his FOREVER HOME. This entry was posted in 6 to 12 Months, Adopted, Adopted Dogs, Dog Center, Dogs, Male. Bookmark the permalink.